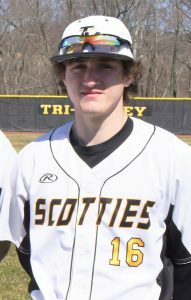 Coach Kevin Yoder’s Tri-Valley Scottie varsity baseball team improved its Muskingum Valley League record to 5-1 on the season, with a Monday night, April 8, 10-0 victory over the host West Muskingum Tornadoes. The visiting Diamond Dawgs – now 5-3 overall on the 2019 season – scored four runs in the top of the first inning, then tacked on six more runs in the top of the third inning to take the 10-run lead, mercy-ruled, five-inning victory. 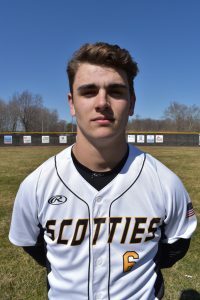 Scottie senior moundsman Justin Fernburg (pictured below) pitched a dandy for the Dawgs – allowing just two hits, and striking out seven Tornadoes to get the shutout win, while clubbing a double as well at the plate. TV sophomore Aiden Fritter (pictured below) led the winner’s 12-hit attack, collecting two hits and knocking in three runs, on the strength of a home run and a double. Tri-Valley’s Chase Kendrick, Brennon Mitchell and Trevor Yoder also added two hits apiece, while Scottie centerfielder Skye Bryan added a double, and TV’s Ty Smith and Tyler McClellan a single apiece as well. Coach Yoder’s Scottie baseballers are back in action on Wednesday, April 10, hitting the road for a visit to New Concord, to battle the John Glenn Muskie baseball squad for a conference battle. On Thursday, April 11, the Diamond Dawgs return to the friendly confines of Kenny Wolford Park to face the visiting Crooksville Ceramics. Good luck to the Diamond Dawgs!